Boileau, John. 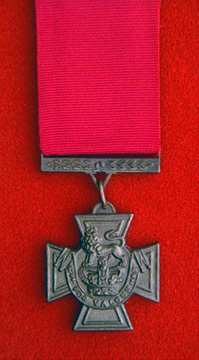 "Alexander Dunn, VC". The Canadian Encyclopedia, 19 March 2018, Historica Canada. https://www.thecanadianencyclopedia.ca/en/article/alexander-roberts-dunn. Accessed 25 April 2019. Alexander Dunn was a son of the receiver general of Upper Canada (now Ontario) and started his education at the prestigious Upper Canada College in York (now Toronto). After his mother died, his father moved the family to England, where Dunn attended London’s renowned Harrow School. In 1852, when he was 19 years old, Dunn purchased a commission as a cornet (second lieutenant) in a British cavalry regiment, the 11th (Prince Albert’s Own) Hussars. Two years later, Dunn — by now a lieutenant and in command of F Troop — sailed with his regiment for the Crimea, on the Black Sea in Eastern Europe. The Crimean War resulted from Russia’s long-time desire to acquire naval power in, and access to, the Mediterranean Sea. When Czar Nicholas attacked Turkish principalities, Britain and France came to Turkey’s aid and declared war against Russia in March 1854. Besides a large Royal Navy commitment, Britain sent an army of six divisions, one of which was the cavalry division, which consisted of the Light Brigade and the Heavy Brigade. On 25 October 1854, through a series of unfortunate errors, the Light Brigade of about 670 cavalrymen charged Russian guns at the end of a long, narrow valley, with additional enemy cannons on each side — a brave, yet suicidal example of British military discipline. Although some soldiers reached the Russian cannons, only about 375 returned unharmed to their own lines 25 minutes later. During the withdrawal after the charge, Dunn saved the life of a fellow 11th Hussar, Troop Sergeant Bentley, whose horse would not keep up. He cut down three Russian cavalrymen who were attacking Bentley from the rear, giving him time to escape. Later, he cut down another Russian who was attacking a Hussar private. 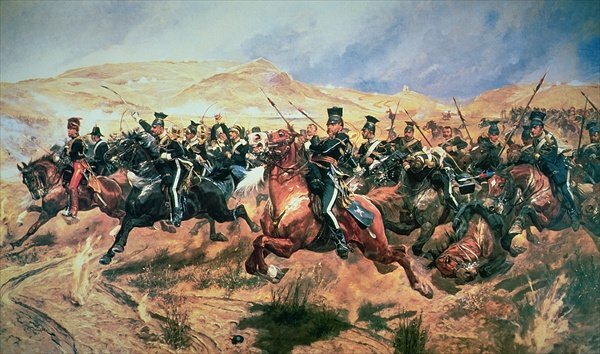 A painting by artist Richard Caton Woodville, Jr., depicting the infamous charge of Britain's Light Brigade on 25 October 1854, during the Crimean War. Queen Victoria created the Victoria Cross to honour the bravery of British Empire soldiers in Crimea, and in what become famous as the “Charge of the Light Brigade.” Among those honoured was Dunn — the first Canadian ever to receive the award. After leaving Crimea, Dunn sold his officer’s commission and returned to his family’s estate north of Toronto. He was soon back in uniform as a major and helped raise the 100th (Prince of Wales’s Royal Canadian) Regiment of Foot in Canada. In 1864, he transferred to the 33rd (Duke of Wellington’s) Regiment of Foot and became its commanding officer, as well as the youngest colonel in the British army. In 1868, the 33rd was sent to Abyssinia (now Ethiopia) to participate in the campaign against the country’s emperor. Dunn was killed while hunting when his rifle accidentally discharged, although there was conjecture at the time of either suicide or murder. Dunn was buried in a tiny cemetery near the town of Senafe (in present-day Eritrea), which eventually became neglected, although it appears that Italian soldiers maintained it during the Second World War. Since 1982, the Commonwealth War Graves Commission has cared for it. Much-needed repairs were carried out by Canadian Military Engineers in 2001. Dunn’s sword and campaign stool are owned by the ​Canadian War Museum. In 1966, the Archaeological and Historic Sites Board of Ontario unveiled a plaque in his honour in Clarence Square on Toronto’s Spadina Avenue, not far from where Dunn grew up, headed “Canada’s First Victoria Cross.” In 2011, the ​Kanata, ON, branch of the ​Royal Canadian Legion established the Alexander Dunn V.C. Park in his memory, one of five Kanata parks named after war heroes. Cecil Woodham-Smith, The Reason Why (1953); John Harris, The Gallant Six Hundred: A Tragedy of Obsession (1973).